Situated close to the beach in Zaton, Vacation home Ivanka is located in a beautiful cove and presents air-cooled accommodation with free internet access. All units have a balcony or patio, and most of them feature spectacular views of the Adriatic Sea. Each unit comes with an electric kettle and a refrigerator, while apartments have more kitchen amenities. Frequent grill facilities are at guests' disposal. A 6 centuries old fortress is in front of the property, and plenty of historic palaces of the Dubrovnik aristocracy can be seen in Zaton. Vrelo Source of fresh water is conveniently obtainable at the bottom of the bay. Free car parking is provided. The settlement centre is 500 metres away, same as a supermarket and a bus station. Villa Ivanka is 10 km from the magnificent Old City of Dubrovnik. Shuttle service and various trips can be organised at a surcharge. 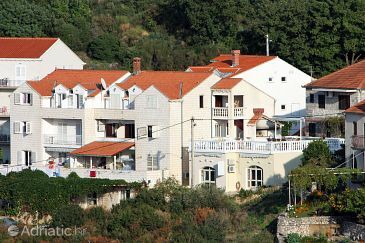 Apartment Anka ~0,1 km, Zaton Dubrovnik Apartment Anka is a self-catering accommodation situated in Zaton. Accommodation will provide you with air conditioning, a balcony and an outdoors terrace. There is a full kitchen with a microwave and a fridge. Featuring a shower, private restrooms also come with a hairdryer and free toiletries. At Apartment Anka you will find a terrace. Dubrovnik Flight terminal is set 24 kilometers away and airport shuttle service is available upon a surcharge. Kolocep ( ~ 3.4 km ): 17+ accommodation units. Mokosica ( ~ 4.8 km ): 63+ apartments. Trsteno ( ~ 5.3 km ): 27+ apartments. Lapad ( ~ 5.3 km ): 656+ apartments. Dubrovnik ( ~ 6.7 km ): 1597+ accommodation units. Beach Kolocep, kolocep ~ 3,5 km from Villa Ivanka Sandy beach: ideal for families, recommended for young people, with restaurant, with caffe bar, equipped with showers. Excellent choice of watersports. Beach Hotel President ~ 4,2 km from Villa Ivanka Concrete beach: ideal for families, recommended for young people, with restaurant, with caffe bar, equipped with showers. Excellent choice of watersports. Beach Copacabana, Dubrovnik ~ 4,3 km from Villa Ivanka Gravel beach: ideal for families, recommended for young people, with restaurant, with caffe bar, equipped with showers. Excellent choice of watersports. Beach Fkk Cava, Dubrovnik ~ 4,4 km from Villa Ivanka Gravel beach: with caffe bar, equipped with showers. Beach Neptun, Dubrovnik ~ 4,5 km from Villa Ivanka Gravel beach: ideal for families, recommended for young people, awarded with blue flag, with restaurant, equipped with showers. Restaurant Arka, Dubrovnik ~ 1,4 km from Villa Ivanka Address: Stikovica 22, Dubrovnik. Cuisine: Croatian cuisine. Restaurant ancora, Dubrovnik Guest reviews: 8,3/10 ~ 0,9 km from Villa Ivanka Address: zaton velicki, Dubrovnik. Cuisine: Croatian cuisine.